Many homeowners love their large kitchens but are not sure about how to make them more functional. The answer is easy: adding an island is the best way to go! When these changes take place, there’s the added complexity of making your new IKEA kitchen not only pretty, but also functional. With such a large space, there’s flexibility for an improved IKEA kitchen design. After moving to a new home, you’ll probably end up changing most of it to make it your own. This means that there’s lot of work to do: removing old cabinetry, choosing new flooring, paint walls with different colors and maybe changing a few walls here and there. See how we improved this space with IKEA kitchen cabinets. Sometimes we receive unusual design requests that are a true challenge. This IKEA kitchen design was special: it was going to be a kitchen for a farmstore where cooking lessons were going to take place. We needed to keep in mind that the design had to combine multiple work areas, accessible and functional storage and still have a cozy, charming look to go with the modern cottage style of the space. This gorgeous IKEA kitchen was designed to work with a budget of $8,977 and the price includes: cabinets, sink, faucet, accessories and a slide-in FRAMTID range. This was a large room that could be easily used for an IKEA kitchen with multiple workstations. We don’t need complicated architectural drawings to get started with your design. A clean hand-drawn sketch will do. Cottage kitchens are simply charming with an emphasis on functionality. They’re built for comfort with features that help you through your routine and bring life to the hub of your home. Whether you’re just refreshing your cottage kitchen or looking to add a dash of old-house charm to a new space, these ideas from IKEA can help you steal the look and have it for your own home. Take a look at the following tips to create your own IKEA cottage kitchen! If you don’t know how to add cottage charm to your IKEA kitchen, take a look at our design tips! Renovating a kitchen is no small task. Making it look beautiful while keeping it functional is another challenge. Even if you’re handy around the house, sometimes it’s just too much stress. This is why our customers preferred to contact us directly for their renovation: they wanted a brand-new IKEA kitchen design to transform their home. This lovely kitchen was completed with a $4153 budget and designed with ADEL off-white doors. 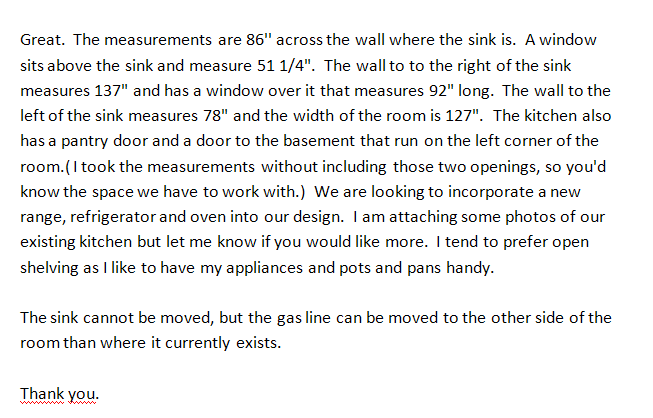 We received the sketch of the kitchen as it was with additional notes from the homeowners. White kitchens are still popular. It’s on modern and traditional kitchens alike and here at IKD we want to share some of our favorites with you. Check out these 5 beautiful white kitchen designs and discover why this kitchen color is still a classic and how to make it work for your own IKEA kitchen design. We’ve worked with different layouts for white IKEA kitchens. These are among our favorites and you’ll see why. Steal these ideas for your white kitchen! The bold white IKEA kitchen: Perk it up with a splash of color! The ADEL & AKURUM doors from IKEA were discontinued by the manufacturer after the date this article was published. When there’s not enough space for a laundry room it’s necessary to look in unconventional areas. An empty space under the stairs can easily accommodate a tiny, tucked-away IKEA laundry room. Here’s a clever design that has been done with a budget of $727 with ADEL white doors and AKURUM cabinets from IKEA. For this ADEL white laundry room, less is more.